Surprise your boyfriend or husband by sending him a nice good night text or card. On this page we present you a large collection of good night messages for him with images that you can send to your honey. 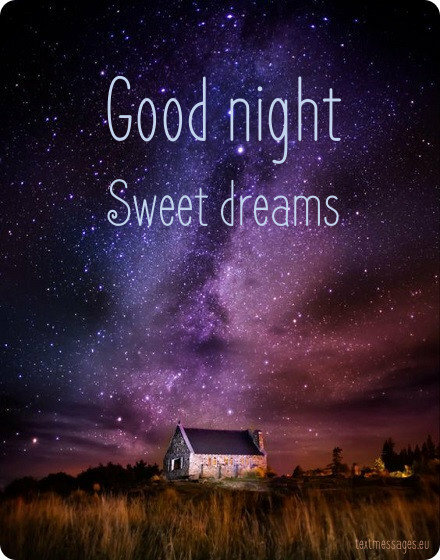 These cute good night wishes and cards will bring the smile on his face and make him feel special. Hope that you will find the words that you like. Good night to the most amazing guy in the world. Good night and sweet dreams, but your dreams cannot be sweeter than mine because I dream about the sweetest thing – about you. I know neither of us are happy being away from each other. 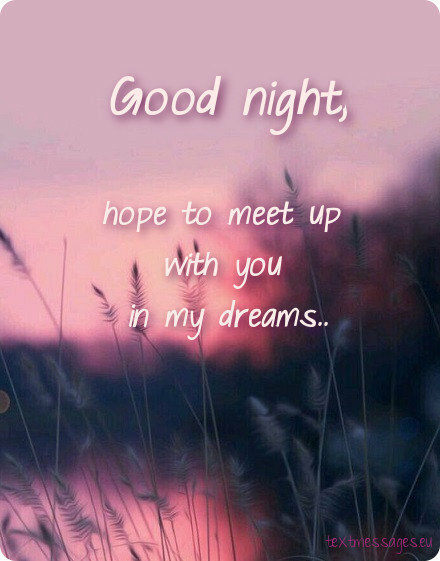 But still I wish you a good night sleep, because tomorrow we will be together and will have full day to cherishing our love and fulfil our dreams. Good Night my Love. Even if I count each and every star everything still seems dull due to the fact that you’re the brightest one in my life. Good night. Sweet Dreams my Love!! I get the sugary shivers down my spine, whenever I think about how you’re mine and I’m yours. Good night baby. I dream about that perfect world where every day would start with a kiss from you and every night would start with a cuddle with you. Good night, my sweetheart. As long as I am waking up with a messages from you in the morning I don’t mind having even the scariest dreams. At the moment I am starring at the picture we took together in the morning, so I can easily pass the lonely night. Good Night love! This night I wish you to sleep calm as never before. I‘ll be next to you. Good night! I know how hard to fall asleep for you. You have to try it. I will be with you in your dreams. 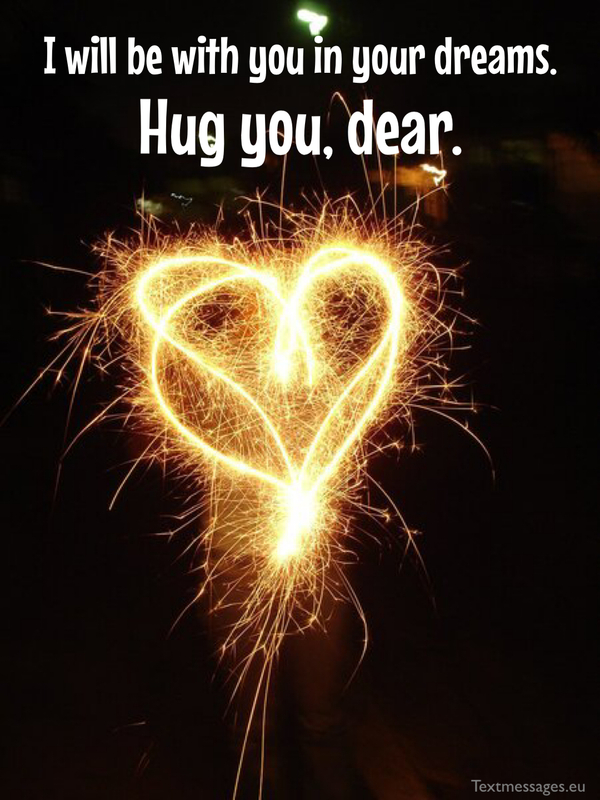 Hug you, dear. Baby when I send this good night message to you it means the day spent with you was Outstanding and Interesting. Good Night and Sweet Dreams. I would like you to know that I will always be with you. Tonight – in your dreams. Go to sleep my boy! I‘m crazy about you. I wanna be with you entire my life and this night. Kiss on the lips and sweet dreams. Do you know what is the best man in the world? I can confidently say that it’s you. Good night my superman! Sweet dreams, my little teddy. Wishing you to have a peaceful night. Waiting for our date tomorrow. Good night and sweet dreams to the person who makes all my days bright and colourful! Love you so much, baby. I‘m very happy woman, because I have you. Love you so much. Quiet night! Close your eyes and relax. I will be near you in your dreams. I never leave you alone. Let’s have a date in dreams. Waiting for me? Go to the bed! Calm down and dream about me. I will help you to sleep well. Good night! Hey! Remember – the warmth you will feel tonight will be the warmth of hugs I am sending you with this message. Sweet Dreams LOVE! All I do is dream about you. Hope that you do the same. 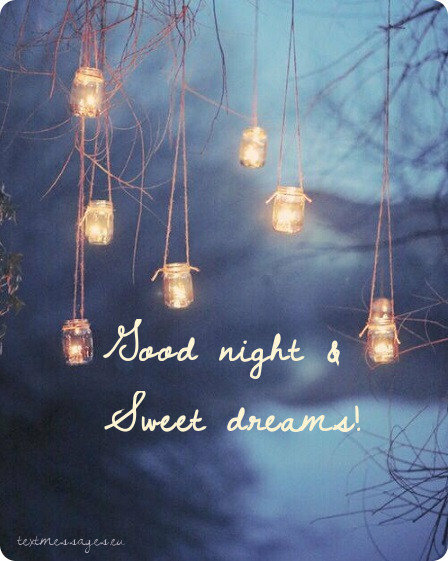 Wishing you a wonderful night. Are you ready for sleep? This night would be longer if we would be together. Wish you a good rest. Nothing and nobody can replace you for me. I‘d love to be next to you right now. Good night to the man of my dreams! This night is so beautiful. 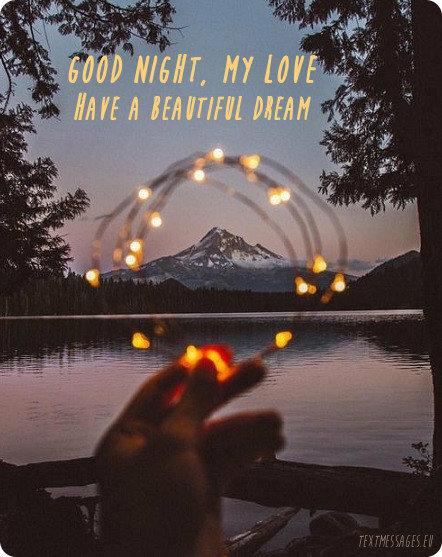 Wish you beautiful dreams too. Miss you already! You are so brave and strong. I will dream about you all night. Good night! Babe, although I can’t be together with you but I want to wish you a sweet dreams. Night will pass very quickly. Waiting for your message tomorrow! This night will be so long without you. I hope that you will sleep well. Love you! My beloved man, I wanna wish you a good night. Dream about me! I wanna be near you, hug you and kiss you. Sleep well, my love. Kisses! Wish you to sleep well and feel renewed from the early morning. Tomorrow will be a day full of works. You have to rest. I would like to send you kiss as small as a sparrow. That kiss is only for you even though I cannot see you… Good night! The night has overshadowed the earth with his wings, I want to be near you and kiss you, but I am not near so I can only wish you good night. And wish you good night! I would like to say something sweet to you, I would like to see you in my dreams, I would like to hold you in my arms and wish you good night…. I miss you so much. I can’t wait to see you tomorrow. Good night, baby, sweet dreams! And only the loving heart whispers you – sweet dreams. After appearance of stars in the sky, I want to wish you good night, sleep well my love. Forget what was bad, have the nicest dreams. May the peaceful dreams make your morning brighter! Good night. You are already sleeping deeply, and I dream about you, about the tenderness of your hands, about your voice, loyalty and trust; about that pure sense which I feel towards you, and about my love and how I cherish you. Sleep well my love. Will bring you wonderful dreams! Sleep well. The sun has disappeared in darkness; the dream invites us in silence. As soon as we close our eyes, we will be near each other. And fly away through your window. I wish you good night! The night is short, so catch the time to rest. Sweet dreams to you, my love. And a blanket of care to keep you warm all night. Next to each other in the dream. And wish to be beside you. I think of you and say „Night night“.